USU Eastern’s The Eagle staff brought home six awards from the annual Utah Press Association’s Better Newspaper competition. In its sixth year of membership in the UPA, The Eagle staff won a first place, two-second place and three-third-place awards. The first-place award was a photo of the downpour of rain on the first day of fall semester classes taken with an iPhone. Students, Emillee Merrill and Kiara Horowitz, had shocked looks on their faces as they walked along 400 north in front of the Central Instructional Building. 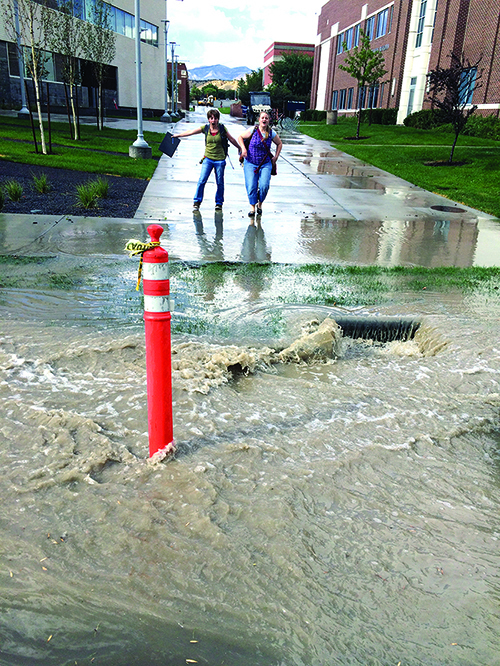 The photo showed muddy water flowing halfway into the street, over the gutter and sidewalks, stopping all pedestrian traffic from crossing the street. The sports writers for The Eagle staff won two-second-place awards. In best sports coverage, Kayla Newman of Gilbert, Ari., wrote about the volleyball season while EJ Sanders, of Oakland, Calif., won for the best sports column with his “Talking Sports” bi-weekly features. Editor in chief, Nathaniel Woodward of Price, scored two-third place awards for his editorial on literature, music and dissent plus overall best news coverage. Horowitz of Bountiful won third place for her Campus Store ads. The Eagle was judged in group one of four-newspaper categories that includes all weeklies and university newspapers under 2,500 in circulation. As a member of UPA, it has the smallest circulation in the state with 1,000 copies printed every other week. A lot of its readership comes from its website at usueagle.com. Other college newspapers belonging to UPA that won awards includes Weber State University and Utah State University winning seven awards each, University of Utah winning six and Brigham Young University four. “Utah has great newspapers representing every area of the state and the Eastern student’s work is judged against other universities plus professionals. Winning in any category is a real honor,” adviser Susan Polster said.